New party formed by Bennett, Shaked will reportedly unite with Jewish Home for coalition negotiations and will create joint Knesset faction. The new party of Naftali Bennett and Ayelet Shaked, “Hayamin Hehadash” (“The New Right”), is expected to unite with the Jewish Home-National Union faction after the elections to the 21st Knesset. According to the report in Reshet Bet, the two parties intend to stand as one block in the coalition negotiations with Prime Minister Binyamin Netanyahu, assuming that he will be tasked with forming the government. In the second stage, the two parties are supposed to form one faction in the Knesset. The goal of the move is to maximize the votes of the right by means of a separate run. Bennett's party will seek to win as many secular right-wing votes as possible, while the Jewish Home-National Union will focus on the votes of religious Zionists. After the elections, when each of the parties attracts as many votes as possible, the two will seek to form a joint faction, on the assumption that it would be possible to reach a higher number of seats than Bennett's Jewish Home in its previous format. 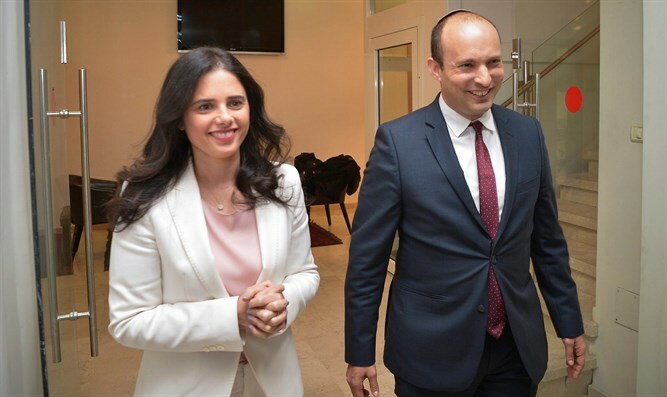 Education Minister Naftali Bennett and Justice Minister Ayelet Shaked announced on Saturday night that they will be leaving the Jewish Home to form a new party. "The Jewish Home has become a very influential force in the State of Israel, but in the last year and even more so in recent months, this era of our great influence has ended," said Bennett. "Prime Minister Netanyahu understood that the wonderful Religious Zionism sits in his pocket, that no matter how often and how much he betrays them, they will stay with him."